True Story Tuesday - It's too late to ground me, right? Somehow, I didn’t ever think the day would come where I would rat myself out to an entire population of bloggy friends… especially the readers who may fill a certain couple in (cough mom&dad cough) on my misdeeds. But that’s what True Story Tuesdays are for, right? Coming clean with all the craziness that no one could believe all happens to one person. Sharing all those tales that are almost too funny/outrageous/miraculous/hilarious to be true. Come on, you know you’ve got a few of your own. Heck, you’ve probably already posted a few. Just grab the code under the True Story Tuesday button on the sidebar, add it to your link, then come back and plug in your post link for some comment love. After all, that’s what True Story Tuesdays are for, eh? Remember my last TST? I mean, who could forget? The crazy Kirby vacuum cleaner getting tangled in my hair and smacking violently into my forehead repeatedly while my father sat and laughed himself silly. Now I wish I could say I got my revenge on the Kirby vacuum, but that beast just wouldn’t die. But that camper… well the camper was another story. Well, I wasn’t overly fond of camping – being the prissy city girl that I was (my family laughs maniacally at the thought that I now live in the country with three horses behind the house). I certainly didn’t have much use for the fake hotel that didn’t even have a bathroom. And I certainly didn’t have any use for it since I had to help clean it when I didn’t even want to go anywhere in it. With summer past, I could breathe a sigh of relief. We wouldn’t be going anywhere in the rain. And we sure wouldn’t be going anywhere in the snow. And Mom… if you’re reading – even though I already told you not to – remember that you LOVE that picture, and you especially love your oldest daughter who would never do anything intentionally to upset you. Sooo… we headed outside for some major snowball fights just a few moments after that classic 80’s picture was taken (I was so rockin’ that acid wash denim jacket). We shriek and scream and dodge and pelt our way through most of the snow in the driveway. My sis starts grabbing handfuls of snow off the truck. 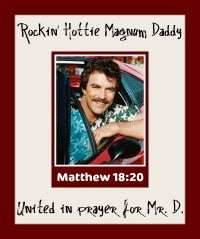 I haul myself bodily onto the hood of the truck (sorry Dad), and clamber up the windshield (Mom is wincing… I told you guys to quit reading). I hang like a rock climber from the cab-over part of the camper (I was less than 5’ tall, I didn’t say it was a GOOD idea). Then finally scramble onto the top of the camper. Whoo-hoo! King of the hill! My poor sis is getting pelted with snowballs from above – from my exceptionally brilliant vantage. She shrieks, attempts a few feeble retaliatory snowballs, then retreats around the back end of the truck. By golly, I wasn’t going to let her get away with that! Not when the supremely non-athletic me had finally found a way to best her throwing skills. Oh, it wasn’t enough that I just (ahem) BREAK something, but my entire right leg goes through the plastic ceiling vent and I am wedged tight. And darn those siblings with perfect hearing… that little sister stopped dead in her tracks and turned around with a look of pure shock on her face. Then followed an extremely painful series of negotiations in which I believe I agreed to do my sister’s chores and eat her vitamins for 14 years. I managed to somehow extract my leg with only minor injuries, but my physical wellbeing would be in far greater jeopardy if my dad found out what had happened to his camping treasure. So… ummm… I… I… I didn’t tell him. That’s right folks. I somehow managed to pay my sister off long enough for her to forget about the “incident”. Except ‘til early summer. When Dad went out to ready the camper for our next trip. And opened the door to discover massive damage. I know you’ve got some great stories – and we’d love to see ‘em! Link up below and we’ll be around with some comment love! 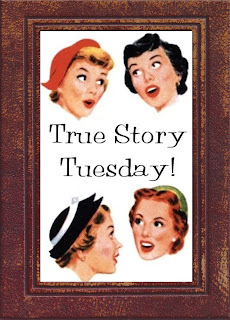 Happy True Story Tuesday y’all! Duuuude - we LIVE next to your parents. Do you honestly think I'm not gonna just open the bathroom window next time you're singing in the shower? That's too funny! I love telling my parents all the crap that I did - just cause they can't ground me now -Ha Ha! That was seriously a miracle that your sister didn't tell on you for something so big, that must have been so hard for her. Why is it that we all have that same acid wash, sherpa lined jacket? Actually, I think that I even had two! I know, I'm rad. And I still want thick hair. And you totally rocked that jacket. To funny. YOu will have to come back with another True Story Tuesday to let us know you punishment from you parents since they now know the truth!! Just tell them the guilt you've carried all these years in silence has been more than enough punishment and you're so glad you no longer have to bear this burden alone. Thenlet me know how long until they stop laughing. This story is hilarious! LOL...I would have done the same darn thing! Never bring on the IRE of dad when it comes to his favorites things in the whole world. I also feel your pain with camping. We "camped" about every weekend in the summer as we were always competing in rodeos, so overnights were pretty frequent. At least they usually had showers and toilets on the rodeo grounds. I have NO desire to go camping now...even years away from it. Rach the adventures you have !!! But I guess everyone has a camper story, as you've just pointed out! Bahahaha- Darn those sisters and their perfect hearing! I would have had to have some serious ammo on my sisters to keep their mouths shut. They just LOVED to tattle! What's even funnier is that you had the typical kid reaction when you do something really bad. You ran like a chicken with your head cut off, hid, and pretended it never happened. Love it! Oooh you're in trouble! I would have totally done the same thing. That is way too funny! Please follow up with your parents reaction! OK, my 1st MckLinky thingamabob is wrong...that's why I had to do it again. I spelled .com wrong. After you read my post you'll see that I'm not myself today. Drats! Oooh you are SO grounded! LOL! That is hilarious! That is hilarious...whats even more funny is that they never knew what happened until now!! You and your funny stories...love them! Ohhh.... That's good, I mean bad. Yikes I don't know what my parents would do know if I had done something like that. Probably laugh and then be a little perturbed. This is my first time linking up! Oh my! I can't believe you didn't tell them! I think I would have cracked under the pressure! Great hair, btw! I would kill for thick curly hair! LMAO Nice! I wonder if they'll make you pay for the damage now! Oh and I hear you on that hair thing... as you'll see evidenced by my blog today, lol. Look at all of your linky love. HOw cool! This is the funniest thing I've read in a long time!! LOL! For one... I had that acid washed jacket and big hair, so that was pretty darn funny. Second, you were just soooo bad. I had to laugh!! Oh my goodness. I still can't believe your sister never busted you! I can't believe you finally admitted the truth! Even more so, I can't believe that your sister kept quiet about this for so long. WOW! That's a very fine example of what we would call a campfire story: a retelling of something around the campfire when everyone's relaxed and you're too old to get in trouble. Well, really in trouble. Good one. OMGosh Rach!!! This may just be the best one yet!! Thank you for the visuals by the way! I can totally envision you dangling there LOL!!! Hope your not grounded!! Or worse yet....CAMPING!!!! hilarious. Thanks for sharing, I love True Story Tuesday...just found this. Great idea!